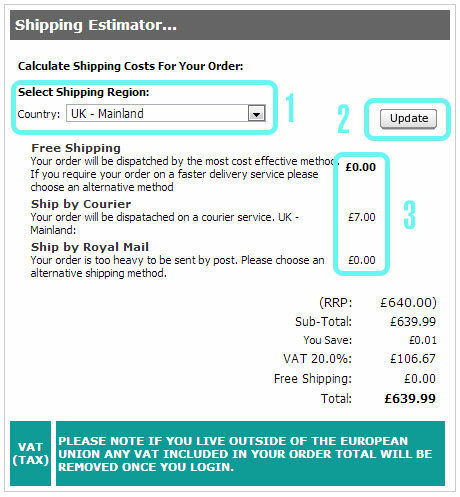 To calculate how much shipping will be on your order simply add the items you wish to purchase to your shipping cart and the shipping options to your desired country willl be displayed below the cart. The images below show the page and the location of the shipping estimator - you will need to have some items in your cart already. On the shopping basket page you will see the Shipping Estimator. offer a fast, efficient and hassle free delivery service. You choose which products to buy and decide where you would like them sent, and we will make sure your items are carefully packaged and arrive safely and quickly. *We try our best to get all orders dispatched within 24 - 48 hours of receiving your order. then you should normally allow around 3 - 4 days to receive your order. During busy periods, e.g. November, December, you should allow 4 - 5 days to receive your order. However, if you live in northern parts of Scotland, delivery periods are 2 days, even though they are sent on a 'next day' service, sorry. then delivery times will take longer. Normally 3-5 business days for Western Europe, 5-7 for Spain, Italy and Eastern Europe. Outside of Europe things take a bit longer, around 5-12 business days. We use DPD for all items which are too large to post so, if you happen to be out at the time of the delivery a card will be left and you can collect the item from your local post office. Unfortunately it is not possible to advise on the actual time of delivery. A signature is required for all orders sent via DPD. Someone must be at your delivery address to sign for your parcel between 8am and 6pm. FREE SHIPPING is available within the UK and Western Europe and will be indicated in your shopping cart when available. All items not received must be notified to us in writing within 14 days of the order being dispatched to enable us to make enquiries and register a claim with the carrier. Items reported after that time cannot be refunded. Items damaged on arrived must be reported in writing within 48 hours of receipt. Claims made after this time cannot be entertained. FREE RETURNS for Paypal Customers by Paypal. Just activate PayPals Return Shipping On Us in your Paypal Account https://www.paypal.com/uk/webapps/mpp/refunded-returns Then process your free shipping direct with Pal Pay by uploading your reciept for the return cost. Conditions Apply See Paypal for details. Please DO NOT write directly, apply stickers or stamps on to the original packaging as this will affect our ability to re-sell the item and may result in a refund being denied if one is requested. We reserve the right to refuse items sent back with defaced or damaged packaging or to charge for the packaging to be replaced. Please note that you are responsible for any returned items until they are received by us. For this reason we suggest you use an insured method of return such as recorded delivery. You are responsible for the cost of returning items to us. We have extended our normal 30 days return policy to make Christmas shopping easier for you. If you purchase any items between 1 November and 25 December you'll have until 30th January to return them to us. This will make buying Christmas presents and the exchange/refund procedure easier for you. For large / heavy items please contact us and we will arrange a collection. 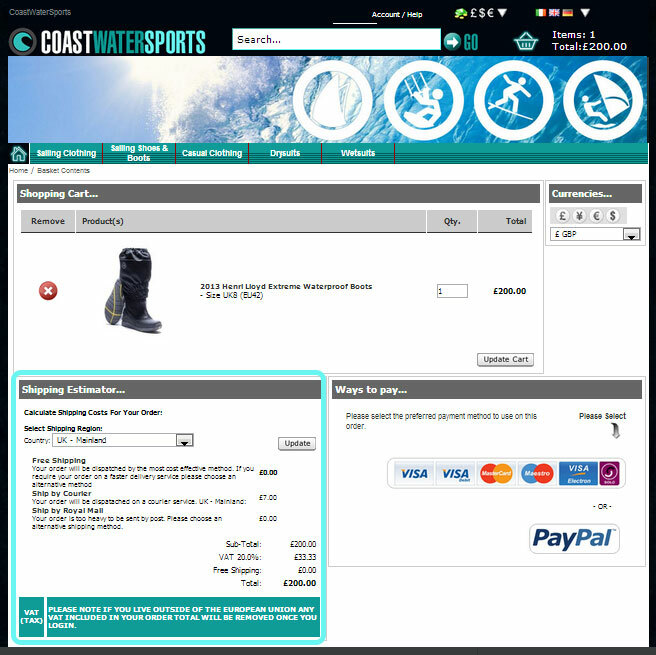 CoastWaterSports will check all items returned as damaged or defective. In the event we find no fault, we reserve the right to re-charge you for the item/s and to recover our fees and expenses from you. If you are not completely satisfied with your goods you may return them unused and in the original condition with tags attached within 30 days of the day that you receive your order. Please state if you require a refund or exchange. See below for goods returned after this 30 day period. Items must be returned unused and in the original condition with packaging with tags still attached. Please do not remove any tags unless you intend to keep the items. Rope which has been cut to your bespoke length cannot be returned. Simply return items to the returns address, which is also found in the top left hand corner of your invoice, include a copy of your invoice if possible otherwise, as a minimum, your name, address, order number and telephone number and add a small note saying what you want us to do. Free Redelivery: For UK customers we will return the item to you free of charge. You just pay to get it back and we'll send you back the replacement free of charge (Only applies to items of clothing). In a hurry: Then just re-order the item you need in the correct size online and send the item that dosn't fit back for a refund. Additional Monies & Refunds: Additional monies for return postage or the additional cost of items can be taken on the same card you used when you made your original order with your permission. Cheques: Unfortunately we no longer accept cheques. Additional monies for return postage or the additional cost of items can be taken on the same card you used when you made your original order with your permission. Just send the item you don't want back to us in its original condition and packaging and we will sort your refund as soon as we get it back. Items must be returned unused and in the original condition with packaging and tags. Goods returned from overseas must be marked clearly with "Returned Goods of UK origin" the description of the contents of the package MUST ALSO BE "Returned Goods" to allow UK Customs clearance. Please do not select "Merchandise", "Sold". It MUST be "Returned Goods". We will not accept any goods returned to us which have incurred Customs charges. Goods which have incurred charges will be refused. Delivery fees will not be reimbursed, in accordance with The Consumer Contracts Regulations 2013 (which supersedes the UK Distance Selling Regulations). Click here for details.